Added on March 1, 2015 by Nathan C. Ward. This is my first ever camera bag, the Tamrac Expedition 3. I bought it used on Ebay for 22 dollars in an uncontested auction. I didn't premeditate this purchase at all, I just knew that my recently purchased DSLR needed a padded enclosure with space for a battery and a memory card. For 22 dollars this is probably the best bag I could have bought. I really like this bag for a lot of reasons. 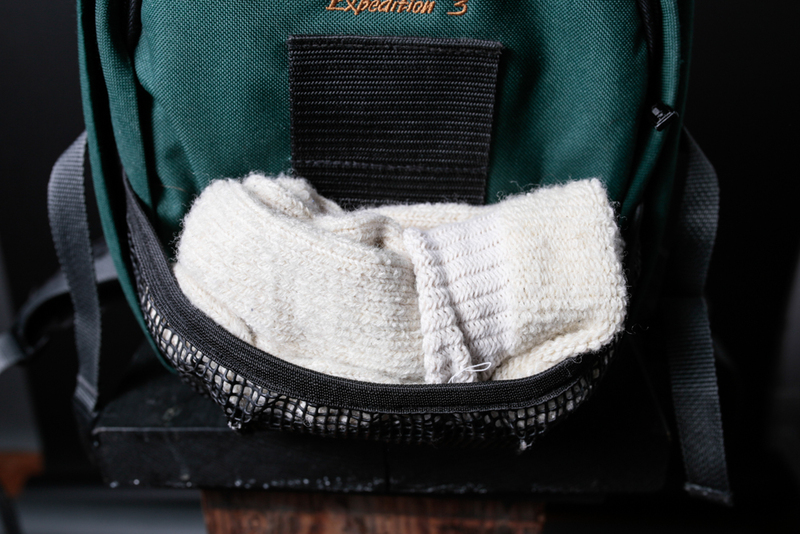 The Expedition is a small pack, weighing in at 2lbs (according the Tamrac's website. 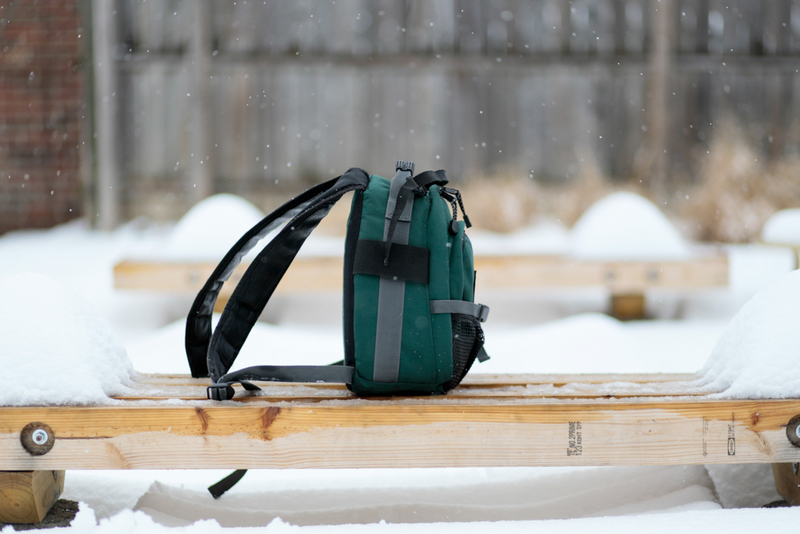 This is also an older pack so weight may vary), perfect for day trips and hobbyist photographic outings. I find I can comfortably carry my full frame Canon 6d with lens attached, 2 unattached lenses, my Contax G1 with lens attached, and all the accessories I need including batteries, extra rolls of film, flashlight, memory cards, lens caps, and depending on the intensity of the "bag Tetris", maybe even an extra shirt. Tamrac says the Expedition should hold a DSLR with lens attached up to 7'' long, and 3-4 additional lenses. What this bag does not hold, very importantly, is a laptop. This is my primary reason for looking for a bag that is not the Expedition. Carrying our computers and cameras at the same time has become a necessity for many working photographers, and I'm no exception. That said, this bag is designed for lightness and portability, and getting to a shoot encumbered. At this task, the Expedition succeeds. So yeah, I shot these photos in a minor snowstorm, which explains all the spotting in the photos. But I thought the trade off of looking like an extremely rustic dude who photographs in the snow was a plus. And I think we want our bags to be rugged, durable, well made, and worthy of all we can throw at it. So hopefully I win one for authentic winter photos. 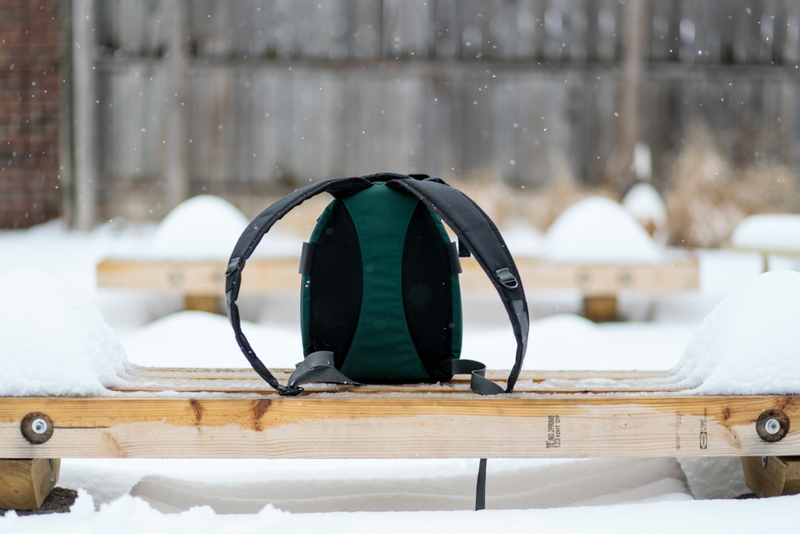 One of the features I really like about this bag is a series of straps on the outside of the main flap to hold a compact tripod. This has come in handy many, many times. But these straps are duel threat. Not only working well for portable sized tripods or monopods, they work excellently for holding an extra layer when you get too hot, or anticipate getting too cold. Pictured here is my waxed Canadian Military jacket I bought up North many years ago, clinched inside the tripod straps. As far as materials used in the construction of the Expedition 3 the Tamrac website offers very few details. Nowadays, I expect every company to tout their design and their materials. 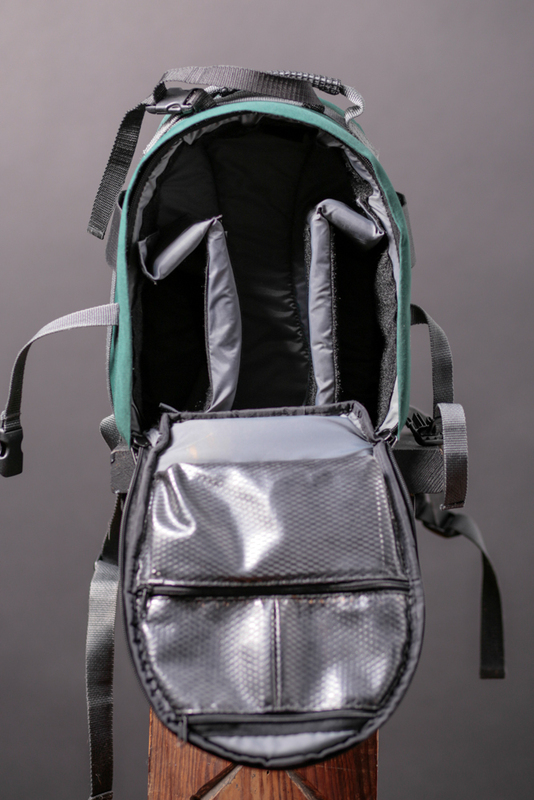 What I can garner by touching the bag is that is maintains a rigid shape with the help of foam padding and has a canvas exterior, with a slight amount of extra padding on the back of the bag (pictured below) so it's easy on the lumbar regions. The canvas extends over the zippers, I assume to shield water from the porous zipper...there is probably a word for this type of design, but hey it's my first bag review! I would say that Expedition is very well made. After a year of use I see almost zero signs of wear....no holes, serious scuffs, tears, rips, or threads coming undone. The padding seems very 'cushiony' and would definitely protect the gear inside if it fell off a table or small ledge. You can just throw this in your car, literally. 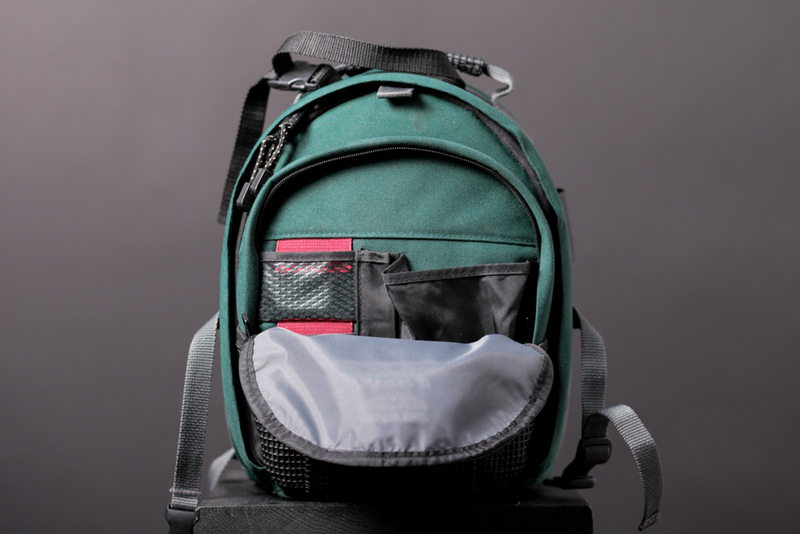 The bag has a two compartment design, both accessed by a zipper closure. The front pocket is the smaller of the two, and I use it for an extra battery, battery charger, multiple rolls of film, my small Contax flash, memory cards, and flash triggers. As you can see from the packed picture above, there is more room left in the pocket...for a hat, an ipod, or maybe a headlamp. I also sometimes keep the power cords for my strobes in this pocket. My Canon battery charger slides in for a snug fit in the built-in pocket to the right (pictured above). Next to that is a slot for a pen or pencil. The last interesting feature of this front compartment is the slot for memory cards. There are two slots vertically alined, just big enough for a single SDHC card in a plastic case ...these pockets are marked by a piece of red cloth at the opening. This is a patented system Tamrac has developed as a way for you to identify which memory cards are available for use. It's a feature that I respect from a design standpoint, but rarely ever used. I personally just don't have that many memory cards to lose track of. Props to Tamrac for a creative solution to a problem many photographers must experience. 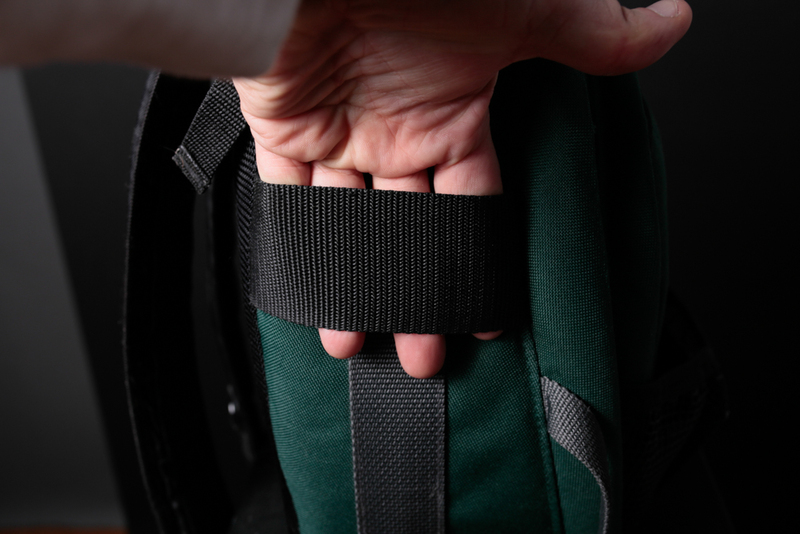 Now onto the main compartment of the bag where your camera and lenses go. The bag comes with a variety of foam inserts that let you customize your bag to your needs. So keep in mind that this part of the bag is set to the gear I carry and the design that I enjoy in a bag this size. I'm using many less inserts then the average person...trying to keep things simple and light. 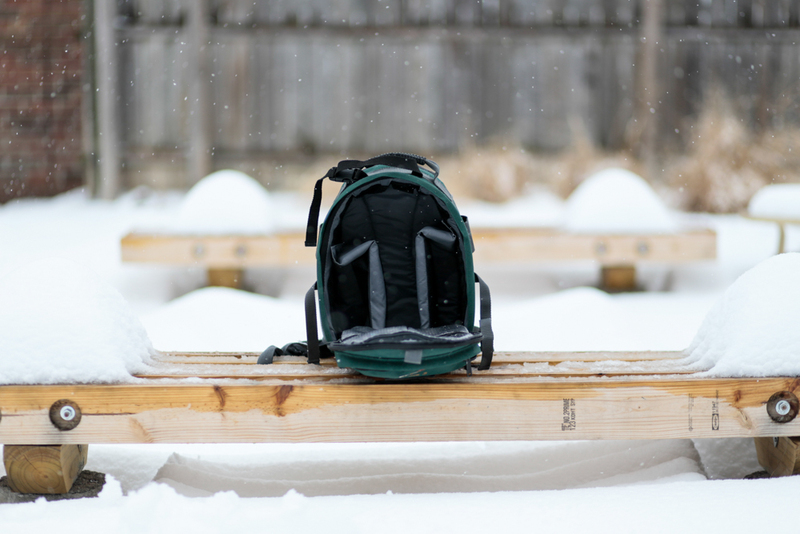 So I've run into my first problem reviewing camera bags, I have to use my camera to photograph things so it can't be in the bag as I photograph it! So I've left space in this photo where my Canon 6D would reside with a lens attached. I decided to snap an Iphone photo of my real camera in the packed bag that I'll include at the end of the review (so that way only people REALLY interested will have to see my not so good Iphone shots). So the way the bag is packed, it can hold my DSLR with the Canon 85mm 1.8 attached (in the empty space not pictured), a little Canon 35mm 2.0, the giant and heavy Sigma 35mm 1.4, a flashlight (the blue thing on the right), My Contax G1 rangefinder with strap, and a roll of Fuji film on top of the camera. I don't think this bag could easily hold a lens as large as the Canon 70-200 2.8, but it just might be possible. I think Tamrac's claim that the bag can hold a camera and 4 plus lenses is only feasible if you are using at least a few compact lens models (the Canon nifty Fifty comes to mind) but is not totally misleading. Anyone using a Fuji or Panasonic mirrorless system could put their whole life in here and probably have room left over for a sandwich and a book. Those of us using bulkier gear can still get a few big L series pieces with our camera inside. The lid of the main compartment has three pockets constructed of a see through mesh plastic material that Tamrac calls 'Windowpane Mesh'. 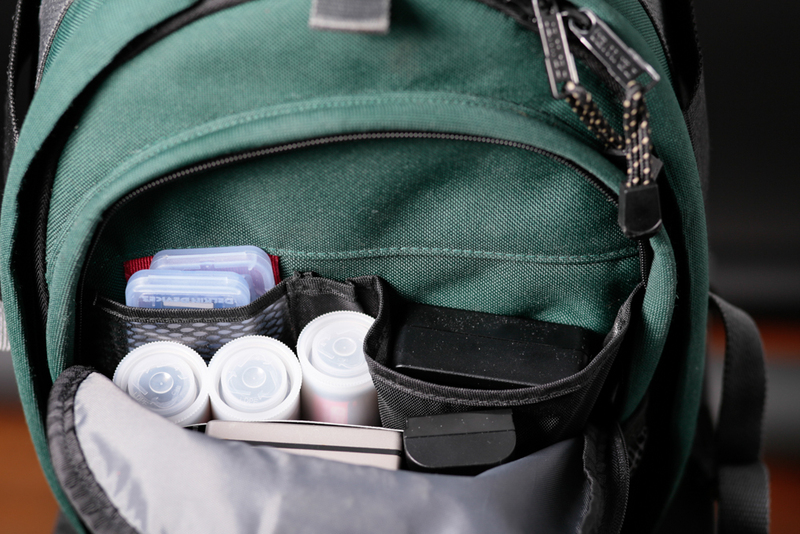 I use these pockets every time I pack for a trip, usually as a second home for batteries, or for the extra stuff I take to photo shoots including small props, Cliff Bars, and paperwork (maps, directions, model release). If I had something important and compact, this is the go to spot to keep it safe, secure, and dry. Now on to the other features that I enjoy about this bag. The first is a mesh pocket at the bottom of the front of the bag. I jammed a pair of Submarine Socks from Best Made Co. into the space to test it's capacity. I always have cold feet, so on a winter photo adventure I would bring extra socks every single time. Some of these other attachments on the outside of the bag I don't totally understand. There is a loop on each side of the Expedition. I can only surmise that they are loops for whatever you can think of...carabiners, rope, extra clothing, monopods, machetes, or to tie your dog to. Maybe they are just for improvising? Also, there is a plastic loop attached to each of the padded straps that I know have a function but can't figure out. If you have any ideas, please feel free to comment on my lack of formal backpack knowledge. I really do like this pack. It's been durable, water resistant, roomy enough for the amount of gear I currently have, and not terrible looking. I know it's not a 400 dollar leather camera satchel, but I don't want it to be. For the price that I paid, it's really one of the best camera bags I'll own. 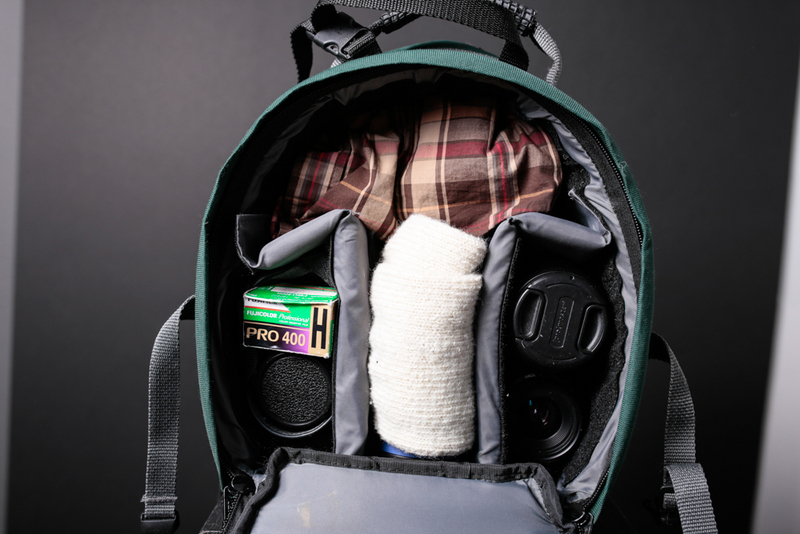 It's a great size to pack your camera and one lens and use the rest of its space for clothing or layers on a day trip. It's also good for the amount of gear a hobbyist would employ...or a professional who travels light. If you're frustrated by the amount of bag options in the world, or the high prices to get a camera bag that you think you might need, maybe just grab an Expedition so you can forget the noise and just go shoot. That's what's most important. I'll leave you with a few more photos, including the Iphone photos I shot of the contents I packed in the Expedition. Thanks for reading!